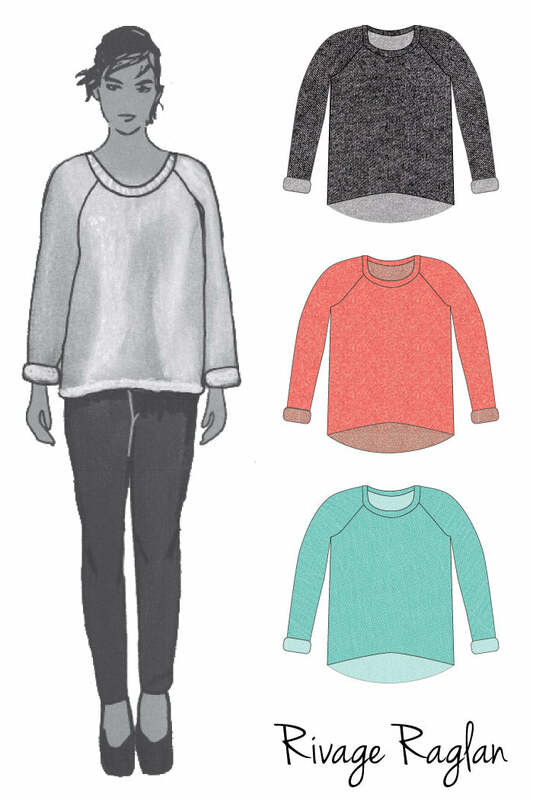 A Rivage Raglan in French terry will be your new favorite cold-weather wear! It’s beyond cozy, but it’s still casually stylish. Rolled up cuffs show off the loopy texture. TIP: Don’t relegate the great back side of French terry to hiding! Use the wrong side as the right side anytime you like. For the gray Rivage dress below (bottom right), I used the wrong side for perfectly coordinating sleeves and pockets. French Terry works great for the Austin Tee and Shoreline Boatneck as well. Both of these patterns come with longer sleeved options, so they’re perfect for sweatshirt alternatives! TIP: Depending on the properties of the French terry you’re using, it might have a lot of vertical stretch. This makes it better suited to slouchy tops; using it for long dresses isn’t recommended because they can grow longer as you’re wearing them. French terry works great for lots of Blank Slate designs. Play around with it and see how you most like it wear it! TIP: French terry, like most knits, can shrink a lot when it’s first washed. So you might want to buy an extra 1/8-1/4 yard, and be sure to prewash and dry at least once. Looking for more options? One of our favorite retailers, Raspberry Creek Fabrics, also carries a wide variety of French terry in solids, stripes, and prints!